Sunday lunch should be an occasion to savour and our weekly changing menu aims to do exactly that. Perched on the edge of Falmouth harbour, our unique position means that you’ll have panoramic views wherever you sit. Enjoy our traditional roast beef with all the trimmings for £15, or push the boat out and tuck into three courses for £22. Our leisurely lunches are served every Sunday from from 12.30pm until 2.30pm. SNOOZY BOOZY LUNCHES ARE BACK! We’re welcoming back our “Snoozy Boozy Sunday Lunches” throughout 2019! 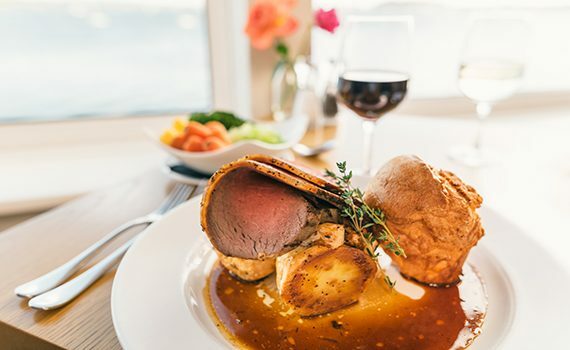 Book a table for four people in the Water’s Edge and enjoy two courses each (roast beef and your choice of dessert) plus two bottles of house red or white wine for £90. Served all day from 12.30pm until 6pm. Please call us on 01326 312440 to book. Please click here to view all of our events and special occasion menus. "The restaurant runs the whole length of the front of the hotel so it’s almost impossible to get a table without that view."